See Your Credit Score instantly! 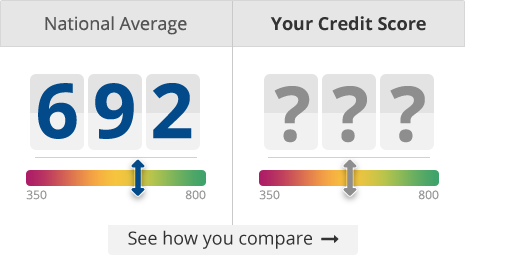 What can a good Credit Score do for you? Having a good credit score can mean lower interest rates on home and auto purchases, big savings on insurance premiums, and even increase employment chances! We let you see your score instantly to see where you stand, while also allowing you to verify accuracy and monitor your credit report for changes. YOU SHOULD. It's one of the most important tools for your financial health. A good Credit Score helps lower your payments for mortgages, car payments, credit cards, insurance premiums and more. Once you've signed up, we'll pull your Credit Score and show where you stand. You'll see how it changes month after month, and our credit expert system will provide personalized information on what is impacting your Score. Plus, we've made it safe and secure, so checking your Credit Score will NOT lower your Score! Just knowing your Score is not enough. If you want to control your financial future, you'll want to review your full Credit Report. You'll see what lenders see when you're buying a new car, buying a home or applying for a loan. Credit Reports are even reviewed for job offers and apartment rentals. With your Credit Report, you'll see a list of accounts, account balances, late payments, credit inquiries and more. You'll also get email alerts for every key change like new accounts and late payments from all 3 of the credit bureaus: TransUnion, Experian or Equifax. Over 8 million Americans are victims of credit attacks each year. Identity thieves can access your bank accounts, get new credit cards and even buy a home -- all using your good name and credit. They abandon the scene and leave a path of destruction, leaving you to clean up the mess -- and your credit. We're here to make sure you survive these attacks. You'll receive a complete suite of credit and identity protection tools to monitor your bank accounts, credit cards, social security number and more. We'll even pay up to $1,000,000 in expenses to help you restore your identity. CreditScoreReportCard is not a credit repair organization and does not offer or provide such services.